When I was a kid, I loved playing outside, climbing trees, running around, playing kerb ball and rollerskating everywhere. I was a bit of a tomboy to be honest! I didn’t have tons of toys but I had enough to keep me busy. I was thinking back to my childhood recently in relation to money matters and whether my early impressions of it have had any bearing on the way I’ve handled money over the years. There are three key money memories – pearls of financial wisdom in fact – that stand out for me during my childhood. When I was around 5 years old, I knew that we paid for our shopping at the supermarket with money. My dad went out to work everyday and he told me that was how he earned money for our family. It dawned on me that my parents liked money. I knew this because they told me they were saving money to buy Christmas presents at Christmas time! That same year, I decided that I wanted to get my parents something nice for Christmas. I didn’t know what though because I didn’t have a lot of money myself, being 5 years old and all. I wasn’t able to pop out to the shops just like that. But what I did have was a pile of copper coins (2p and 1p coins), so I stacked up 6 x 2p coins for each of my family members and wrapped them up in plain white craft paper and sellotape. Each family member received 12p from me on Christmas Day! My family were over the moon with my gift to them (so it seemed) and I felt really happy to have made them happy! When I was a bit older and was allowed to go to the local shop by myself, whenever my favourite uncle came to visit, he’d often give me a £1 coin to spend on whatever I liked there. I remember feeling that these £1 coins were like gold dust! I was able to buy so many sweets with these gold coins and sometimes I’d even save some of the change too! That way, I knew I’d have enough to repeat the experience another day. I had a little pocket money from my dad from time to time (if I’d helped with chores and had been good!) and I treated that in the same way. I was twelve when my Nana passed away. Her death really affected me because she was the first person who was close to me to have died. She wasn’t at all well off so she hadn’t made a will but she left £100 to me, my brother and my sister. She must have known for a while that the end was near because she’d written out the envelope herself with my name on it. I kept that money safe for a couple of years inside a drawer in my bedroom. I didn’t want to spend it because my Nana had given it to me, I even kept the envelope in pristine condition. My parents asked me from time to time if I’d like to spend it on something but I didn’t want to part with it. In the end, I did spend it on some things for my bedroom because my mum said my Nana would have wanted me to enjoy it. I think she was probably right. With each one of these memories, I feel like I had a good instinct around money at a young age. I enjoyed giving money to others because it made me feel happy. I knew that gold coins were worth much more than coppers and I even saved some when I found myself with money in my pocket! I also knew how much amounted to a lot of money – and that sum of money should be treated with care – especially if it was once someone else’s and they had wanted me to have it. I took my time spending it and made sure that when I spent it, I had considered my purchase very carefully. So where did it all go wrong?! From the age of 18, I totally lost my good instincts for dealing with money and started to spend money that wasn’t even mine left, right and centre! I was tempted by all the shiny new things that I saw when I walked past a shop and I just splurged on material possessions for a number of years. The concept of saving money went completely out of the window and I just focused on having as much fun as possible. Roll on many years later and I’m still paying for some of those purchases even now. It’s good to have fun whilst you can and all that. But I do wish I’d retained some of my younger self’s common sense around money in the process! Hindsight is a great thing of course – and obviously when you’re a kid, life is usually relatively simple compared to the challenges of being an adult. What’s your earliest memory of money and has it had any bearing on how you handle money now? 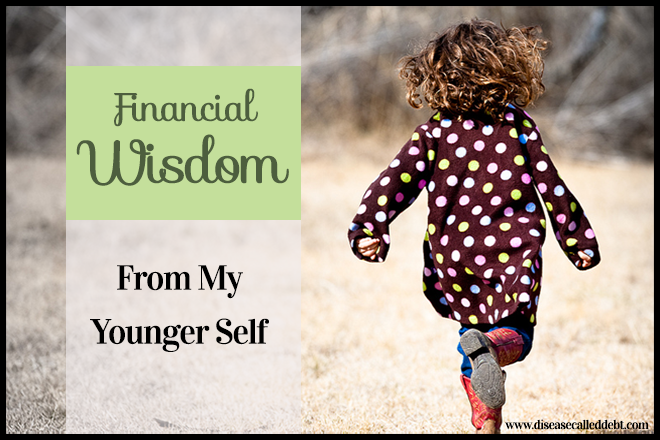 Do you have any childhood pearls of financial wisdom to share? Ever since I was a kid, my parents always taught me the value of saving money. I remember my parents gave me a piggy bank where I put coins that I see in the house or money that my uncles and aunts gave me. Now that I am older, I may not have those piggy banks anymore, but I have valued the importance of saving a portion of my income. As an adult, we should manage our cash flow well to keep track of our finances. Definitely good advice Nichelle. I have a lot of saving to do once the debts are gone to make up for lost time. I think what your mum said about your nana is true! She would have wanted you to enjoy it! I think about when I in the past have given my mom some kind of gift certificate, like to a spa, and three years later she hasn’t used it. It kind of hurts. I digress. My money message was that money was easy peasy and we could get whatever we wanted. It always seemed like the sky was the limit. I think we were a bit spoiled, and therefor took things for granted. Thanks Tonya! Nice to hear another point of view as money being easy to come by. That’s really interesting, because you’re very financially savvy nowadays! Thanks for your kind words about my Nana – I think so too now. It seemed like so much money back then. I remember when I was about 7 or 8 years old I found the equivalent of $10 (I was in Dominican Republic at the time) and instead of saving it or buying useful things, I went to the store and bought as many candy bars as possible and shared them with my friends. sure, I shared but it would’ve been better if I saved that money for something more useful. I was terrible with money since day one! Ha ha! I also used to buy a LOT of sweets Aldo. I saved too but I didn’t buy anything other than sweets. So I guess you could say I’ve always gone the instant satisfaction factor when it comes to spending! It’s a good idea to look back and see where you come from and how you got to where you are now. Thanks for sharing Hayley! On of my most significant money memories was my “paycheck”. My dad and step mom has a list of things we had to do each week that we would get paid for. Example: fold and put away towels $0.75, scrub the bathroom $1.50. Then at the end of the week if everything passed inspection we would get paid. We could use the money for things like popcorn at the movies, but we also has to save part of it because we were required to pay 1/2 of the cost of our summer camp. When my boys are a little older, I will be applying those same lessons to them. Tennille recently posted…Apps That Pay – Stop Throwing Away Your Receipts! This is a great way of getting kids to learn about work – and that different levels of work equal different amounts of pay. I’ll be using this tip for money lessons with my own daughter Tennille! 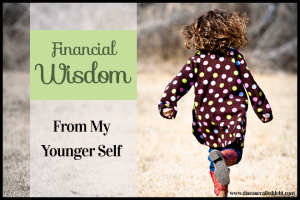 I recently wrote a post that had me think back to how I dealt with money when I was younger. I learned that money took work to come by. I would willingly do my chores in order to get my allowance…but if I saved it, it was to spend it all at some point. I am sure your Nana would have been happy that you used her gift to treat yourself well. Also it’s pretty neat that you learned the joy of giving so early as many kids don’t do so well in that department. Kassandra recently posted…Is Your Spare Room Costing You? We all have made mistakes especially when we were younger. I used to be a big saver when I was a child and then something happened. Things changed quickly and I ended up with a small mountain of debt. Then I paid most of it off. Still working on the rest. Oh well. As long as we learn the lesson, then we are still ahead of the game. I can relate to your point about giving. I love to give now, but I remember it being much easier to give large amounts, before I had a grasp on the value of money. Sometimes I wish I had that same mindset. So true – when money doesn’t have a certain amount of value attached to it, things are much simpler I guess. I had a little tin box with all my money in it and I used to count it all the time! Counting money is a fun (and educational) game when growing up – I actually still enjoy counting mine now! My earliest memory is getting money at Christmas and wanting to spend it immediately. Waiting till boxing day was a real killer. Looking back, it seems my problems started from a very early age and continued into adulthood. Ha Ha! I’m sure many kids would have been the same Rob! I bet you took advantage of those boxing day sales. 🙂 Glad you’re turning your finances around now. Great sharing of your memories, Hayley. It is quite fascinating trying to figure out where we went off the rails, isn’t it? I was pretty good with my money, I think it happened after I got married and was somewhat overwhelmed by fulltime motherhood with four kids all of a sudden. My Mum went by Nana too. I go by Nama – which is half Nana and half Grandma (to honour my MIL). That is so cute that you gave your family stacks of pence! I am sure they thought it was adorable. I have never been in a position where I have received an inheritance, but I bet I would have had the same problem as a child, not wanting to spend it, or to feel like I was letting go of the person by spending the money. Thanks Anne! I remember my brother trying to open his before Christmas Day tut!